This print by James Abbott McNeill Whistler is part of a series of images the artist produced depicting the East London neighborhoods of Rotherhithe and Wapping in 1859–60. While English painters had traditionally avoided portraying these industrial districts of the city throughout the nineteenth century, Whistler’s Thames series takes for subject the city’s poorest workers and highlights various members of the urban working class. Whistler was very familiar with the Dutch tradition of depicting the rural poor in landscape and genre scenes, and poor working-class people had gained increasing visibility as the subjects of contemporary paintings by French realists. However, though Whistler features working-class characters unfamiliar to his English audience, his depictions of East Londoners lack the socialist political agenda of French realism. The viewer sees the dockworkers in the foreground of Rotherhithe in a rare moment of repose rather than in the midst of laborious work, making the scene more palatable to a middle-class audience, and Whistler’s title more conservatively points to a neighborhood rather than the work performed there. Seated with their pipes, the dockworkers resemble typical English gentlemen rather than unsavory or impoverished characters, though dockworkers were among the city’s lowest-paid laborers. While Whistler’s aesthetic choices could be cause for social critique, critics responded positively to the series when exhibited in 1871. Regardless of Whistler’s agenda, the artist’s version of Rotherhithe presented a picturesque, benign vision of contemporary urban life. 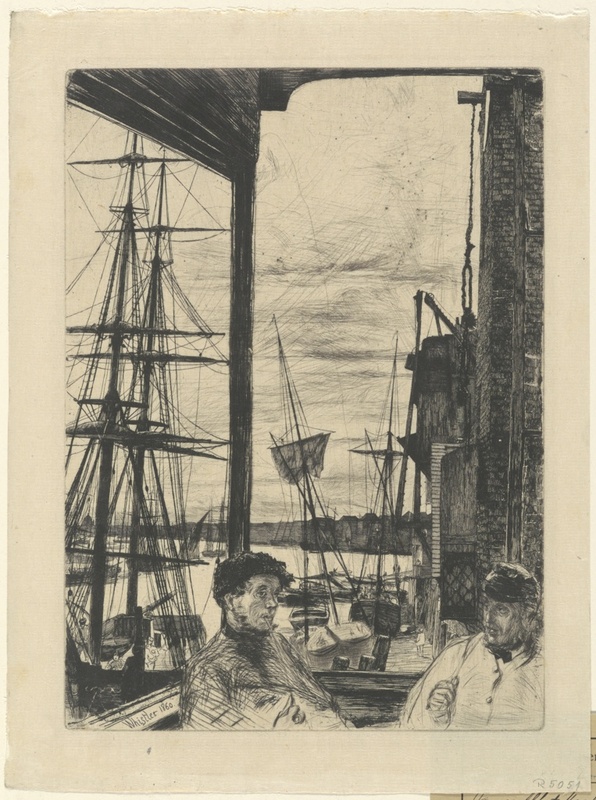 An image of men at work may have better served to highlight the virtue of the working class and the great divide between the rich and the poor, but Whistler instead presents a scene that highlights similarities rather than differences. The portrayal of dockworkers indulging in a rare moment of leisure more strongly connects these subjects with their contemporary middle-class audience, a group that increasingly engaged in pursuits of leisure and relaxation. This print is included in the exhibition The Virtue in Vice, on view at Cooper Hewitt, Smithsonian Design Museum through March 25, 2018. Kathleen Pyne, “Whistler and the Politics of the Urban Picturesque,” American Art, Vol. 8, No. ¾ (Summer–Autumn 1994), pp. 64-66. Robin Spencer, ed., Whistler: A Retrospective (New York: Hugh Lauter Levin Associates, 1989), pp. 86–100, 143–151.